So what makes a dish flexitarian? Coined by Chef Peter Berley, author of The Flexitarian Table (where this recipe came from), the term flexitarian is a union of the words "flexible" and "vegetarian". Flexitarian food is "convertable, so you can prepare a meat version and vegetarian version simultanously without going to extra trouble- you just separate the ingredients into two bowls or pots before you incorporate the protein," Berley explains. Case in point: this recipe is originally vegan, but you could add crumbled feta if you are a vegetarian, or diced sausage if you are a carnivore. The whole point is to include people who eat in different ways, and respecting the different needs of everyone who comes to the table. As the sister of a lifetime vegetarian, this philosophy certainly resonates with me! 5. 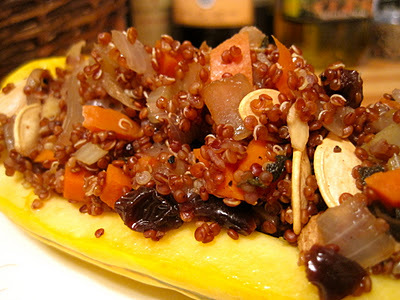 In a large bowl, toss together the quinoa and vegetables. Stir in the dried fruit, pumpkin seeds, nutmeg, and cinnamon, season with salt and pepper.